Porte des Morts Town Park stairs. Submitted. 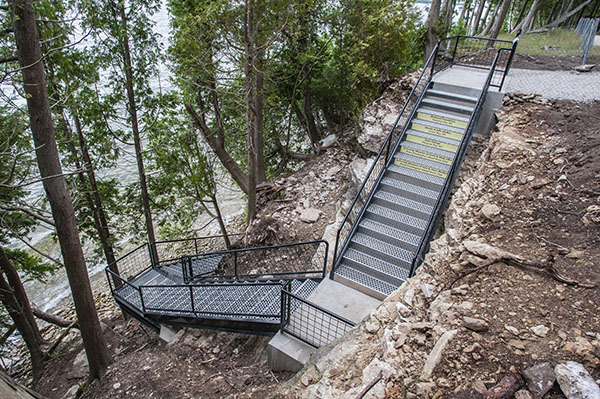 A scuba diving club that wanted better access to the shoreline of a Liberty Grove park has made that happen with a stainless steel stairway now providing access up and down the bluff. The new staircase is at Porte des Morts Town Park, located on the far north shore of Door County between Gills Rock and Northport at the end of Kenosha Drive. 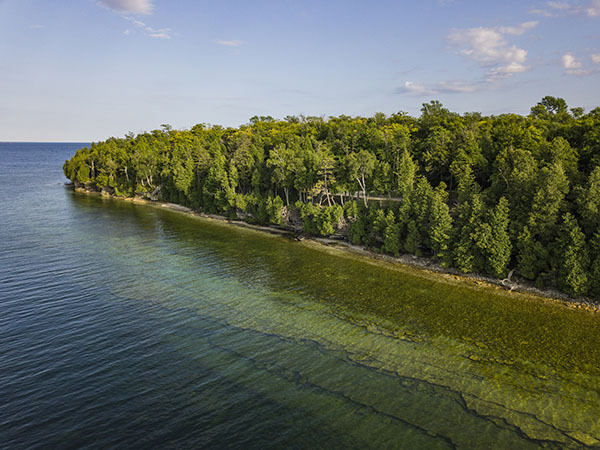 There’s 200 feet of shoreline in this two-acre park that sits on a bluff and overlooks the Porte des Morts Strait (Door of the Dead) that links Lake Michigan and Green Bay. However, there was never a safe way to get to the shore a mere 30 feet below its bluff. Liberty Grove boasts 45 miles of Door County shoreline, yet only a small portion is actually available to the public. Porte des Morts Town Park from the water. Submitted. The staircase provides safe access to the beach and water while preventing erosion of the delicate landscape. It makes the park more user-friendly for all visitors and Door County residents. The club first approached the town about the project. Touscany said while town officials were supportive of the project, the town did not have the money to build the staircase. “So we thought, let’s see what we can do. We started a fundraising campaign and people were very receptive to it,” he said. Touscany said the club took on the Porte des Morts Staircase Project for a selfish reason. Touscany and his dive club members raised enough money in the last eight years to make this stairway a reality. A website was created as well as a Facebook page. Large contributions came from Raibrook Foundation of Sturgeon Bay ($10,000), the town of Liberty Grove ($12,000) and the Wisconsin Coastal Management Program (almost $30,000, or about half the total cost). Touscany also sold places on the risers where supporters could place their names. Open spaces remain should an individual, business or organization want to buy a spot. Plans and construction were developed and completed by James Creed, Henry’s Bend Construction and Pat Hockers of Hockers Excavating. Engineering oversight was provided by Steve Parent of Baudhuin Engineering. Bud (Walter) Kalms is the Liberty Grove Administrator that provided town support for the project. The stairs are now open to the public.